At Panther Healthcare Professional Education is our commitment. Patients may face a long and difficult recovery because traditional "open" thoracic surgery is highly invasive. Today, a surgical technique known as video assisted thoracic surgery (VATS) is enabling surgeons to perform many common thoracic procedures in a minimally invasive manner. 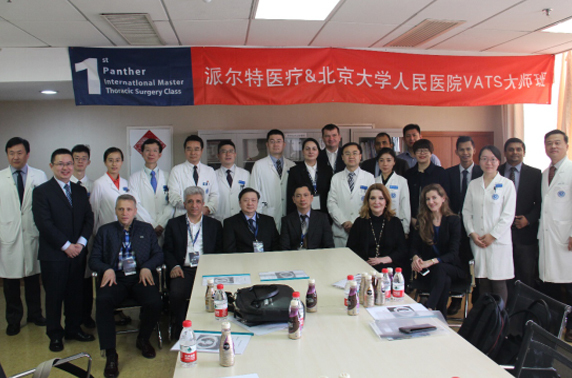 At Panther we understand the importance of VATS surgery and the benefits of its minimal invasive approach, and for this reason we hold several Master classes annually lead by Professor Wang Jun, one of the global VATS pioneers, at the Peking University People’s Hospital (One of the top 10 Hospitals in China where 1500 VATS Lobectomies performed per year). It’s a 2-day course during which around 15 VATS surgeries are conducted with different tips and tricks explanations of Wang’s techniques, lectures, post-surgery discussions of the most complicated cases.